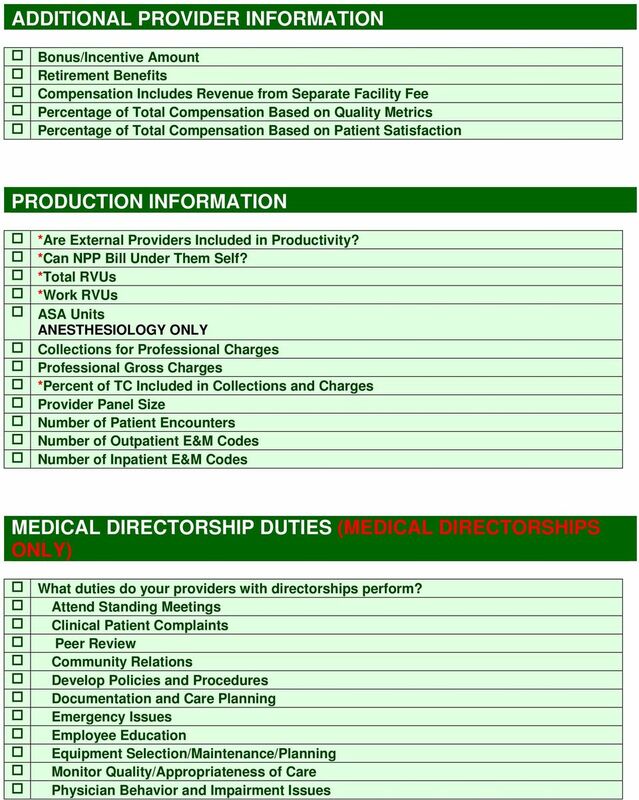 Download "MGMA 2016 Compensation and Production Survey (*Asterisks denote required questions)"
1 MGMA 2016 Compensation and Production Survey (*Asterisks denote required questions) Time is a valuable thing! We ve created a tiered participation benefit structure to ensure we reward you for the time spent completing the surveys. See details regarding the tiers for each survey below. Tier 1: Tier 2: Submit the minimum amount of data required to be considered an eligible survey participant and receive this tier of the participation benefit. Provide us with more than the minimum and we ll reward you with access to expanded benchmarking data in addition to the Tier 1 benefit. Click here to view full participation benefits details. Click below to view the survey guide and learn more about what s included in each question. 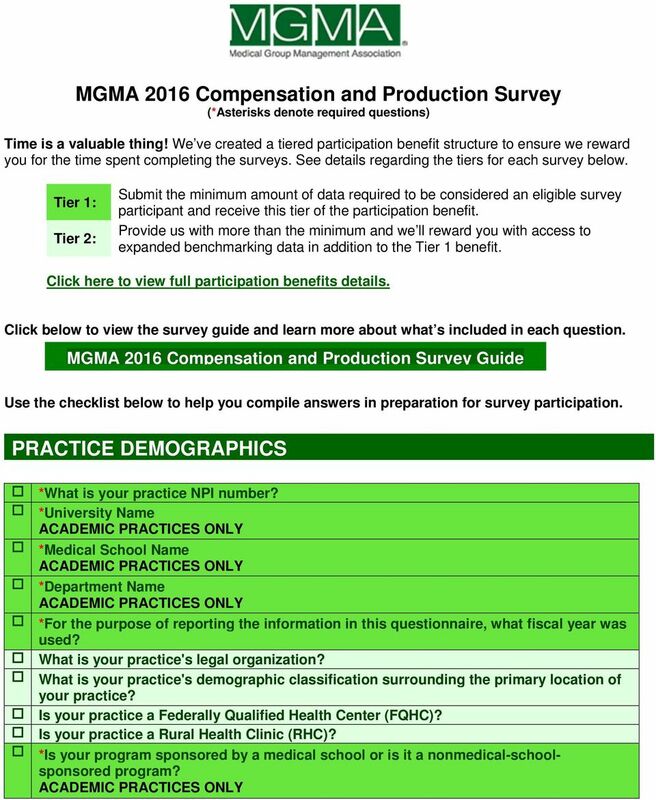 MGMA 2016 Compensation and Production Survey Guide Use the checklist below to help you compile answers in preparation for survey participation. 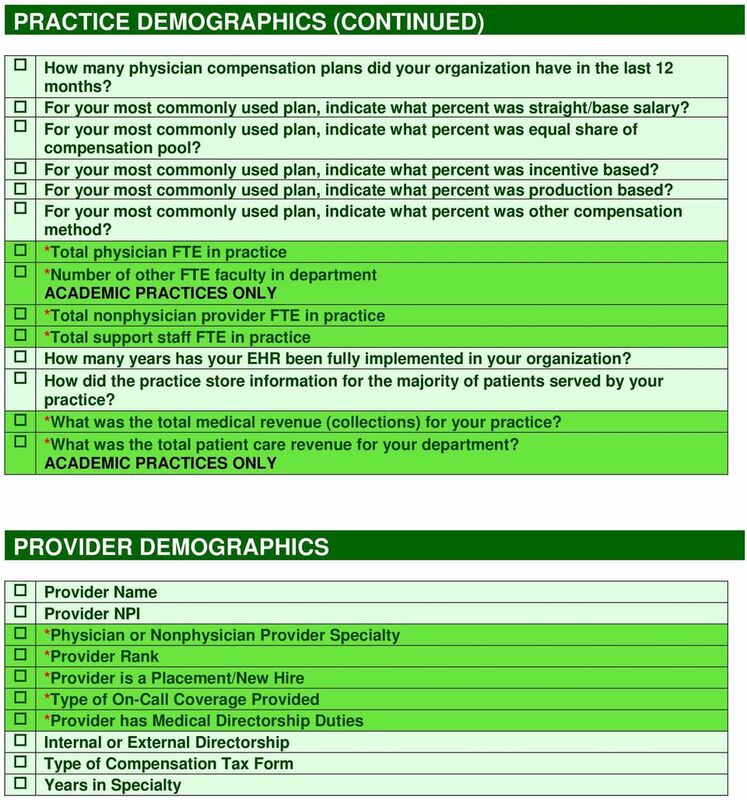 PRACTICE DEMOGRAPHICS *What is your practice NPI number? *University Name *Medical School Name *Department Name *For the purpose of reporting the information in this questionnaire, what fiscal year was used? What is your practice's legal organization? What is your practice's demographic classification surrounding the primary location of your practice? Is your practice a Federally Qualified Health Center (FQHC)? Is your practice a Rural Health Clinic (RHC)? *Is your program sponsored by a medical school or is it a nonmedical-schoolsponsored program? 5 MEDICAL DIRECTORSHIP DUTIES (CONTINUED) (MEDICAL DIRECTORSHIPS ONLY) Physician Education Physician Relations and/or Representation Provide Guidance and Leadership for Performance Guidelines Provider of Last Resort/Call Availability Recruitment Regulation/Licensure/Credentialing Research Strategic Development Technical Oversight Other Duties and Responsibilities PLACEMENT INFORMATION (NEW PLACEMENTS ONLY) *Hired Out of Residency or Fellowship *Which state did the provider relocate from? 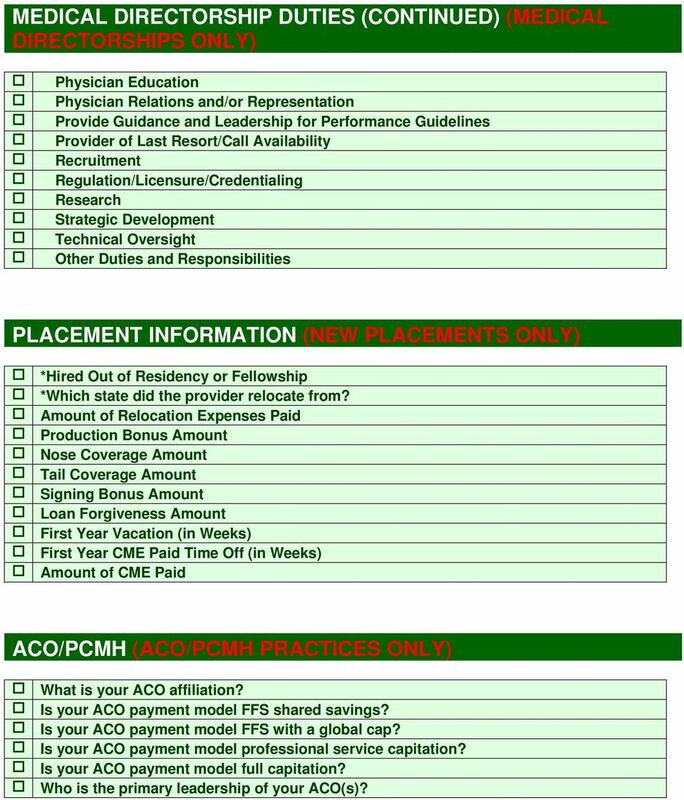 Amount of Relocation Expenses Paid Production Bonus Amount Nose Coverage Amount Tail Coverage Amount Signing Bonus Amount Loan Forgiveness Amount First Year Vacation (in Weeks) First Year CME Paid Time Off (in Weeks) Amount of CME Paid ACO/PCMH (ACO/PCMH PRACTICES ONLY) What is your ACO affiliation? Is your ACO payment model FFS shared savings? Is your ACO payment model FFS with a global cap? Is your ACO payment model professional service capitation? Is your ACO payment model full capitation? Who is the primary leadership of your ACO(s)? 6 ACO/PCMH (CONTINUED) (ACO/PCMH PRACTICES ONLY) Did your practice currently staff additional behavioral health PCMH positions? Does your practice currently staff additional case manager PCMH positions? Did your practice currently staff additional home health nurse PCMH positions? Did your practice currently staff additional nutritionist PCMH positions? Did your practice currently staff additional patient/care coordinator PCMH positions? Did your practice currently staff additional patient education PCMH positions? Did your practice currently staff additional social worker PCMH positions? 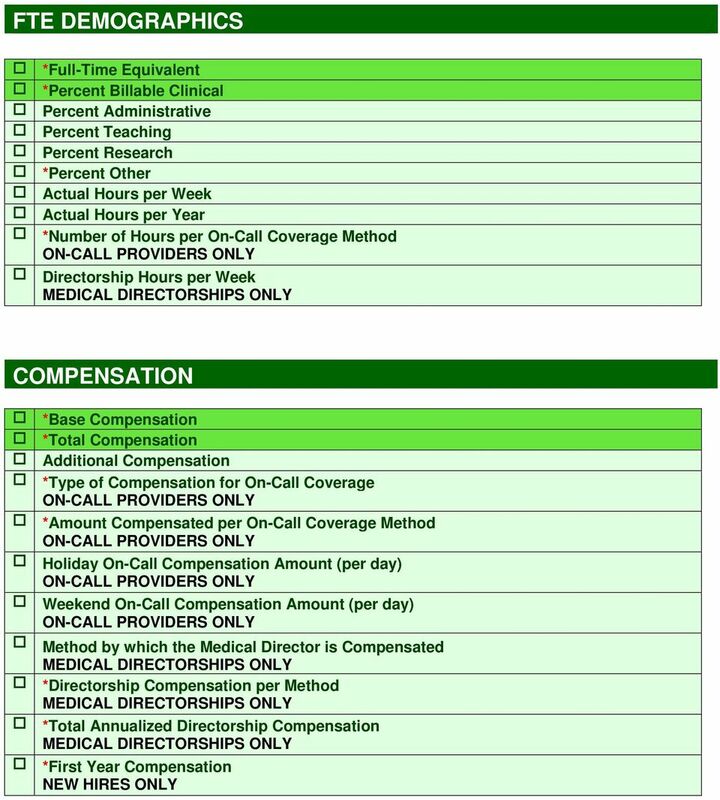 Did your practice currently staff additional other PCMH positions? Did your practice use a capitation PMPM payment model to cover all medical services and medical home activities? Did your practice use an enhanced FFS payment model for office visits, regular FFS or other services? Did your practice use a regular FFS for all services and a PMPM payment model for medical home activities? Did your practice use a regular FFS payment model for all services with pay-for performance or shared savings for meeting utilization goals? Did your practice reimburse PCMH related services using a special HCPCS code? 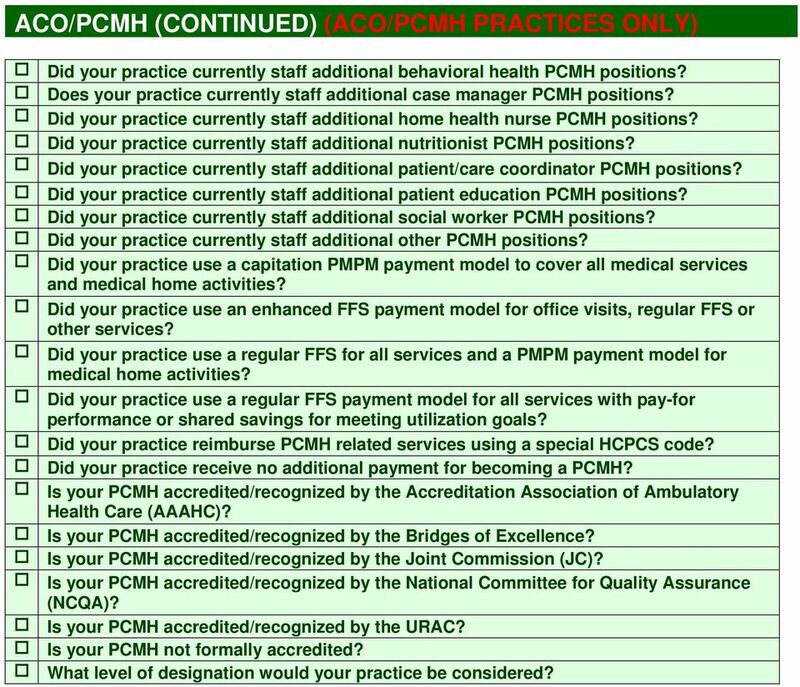 Did your practice receive no additional payment for becoming a PCMH? Is your PCMH accredited/recognized by the Accreditation Association of Ambulatory Health Care (AAAHC)? Is your PCMH accredited/recognized by the Bridges of Excellence? Is your PCMH accredited/recognized by the Joint Commission (JC)? Is your PCMH accredited/recognized by the National Committee for Quality Assurance (NCQA)? Is your PCMH accredited/recognized by the URAC? Is your PCMH not formally accredited? What level of designation would your practice be considered? Allergan/BSM Cosmetic Surgery Benchmarking Database Presented by: Glenn Morley Allergan Practice Consultant Program Overview Voluntary participation of practices identified by Allergan consulting team.